The sun is equally symbolic like the heart. De zon is die geboorte, leven, en positieve energie sinds de oudheid. Het betekent ook kracht, vitaliteit, kracht en moed. One of the deeper meaning of the sun is reincarnation or rebirth; just as the sun rises again on setting, humans are also born again after they die. 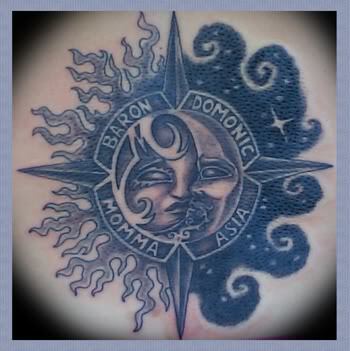 The union of the sun and the moon tattoos represent togetherness, love, relationship, or even sexual union of two partners. Although the sun tattoo is considered a masculine design, it is equally popular with females. Read more on sun tattoo meaning.